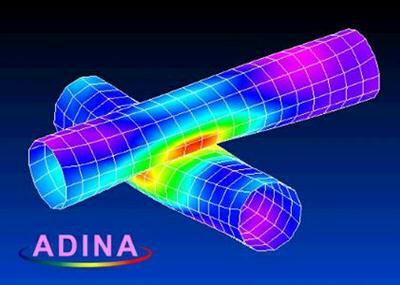 ADINA R&D, Inc., a leading innovator in simulation software for solids, structures, fluids and fluid flows with structural interactions, has announced the release of the latest version of its popular ADINA System, version 9.2.4. The ADINA User Interface (AUI) uses the Parasolid kernel as its geometry engine. Hence, users of NX and SolidEdge can easily import their Parasolid-based geometry models (parts and assemblies) into the AUI for meshing, apply geometry-based loads and boundary conditions and perform structural, heat transfer, fluid or coupled multiphysics analysis using the ADINA System. ADINA can also import finite element models in Nastran format and output results in the Nastran op2 format. Users of NX, I-deas and Femap can therefore build their finite element models in their pre-processor, run the analysis with ADINA and post-process the results back in their environment.